Some 3,000 teachers wore Black Lives Matter shirts on Oct. 19th—now they will wear them to school for Charleena. 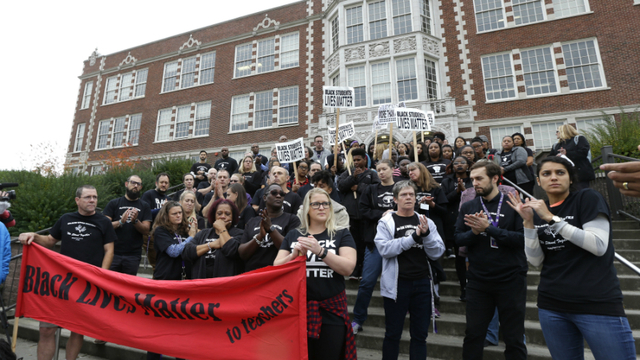 What/Where: Seattle teachers and educators will wear Black Lives Matter shirts to school, hold lunchtime speak-outs, and rally at 5pm at Magnuson Park. Then Educators will march to a 6pm press conference at the Brettler Family Place apartments where Charleena lived: 6850 62nd Ave NE, Seattle, WA 98115. When: Tuesday June 20th, 5:00pm educator rally, march to 6pm press conference with Charleena’s family. Who: All Seattle teachers, educators, and families are being encouraged to wear the Black Lives Matter shirts on Tuesday in solidarity with Charleena’s children and family. RSVP on the Facebook event page now! Seattle, WA—On Sunday, June 18th, Charleena Lyles, a pregnant mother of four, was killed by Seattle police after she called them to her home for help. Police alleged she had a knife. She was killed in front of her kids, who had to be carried over her body to leave the apartment. Chrleena had children who attended two different Seattle Public Elementary Schools. Educators from those schools have been contacted. Earlier this school year on October 19th, some 3,000 educators wore shirts to school that said, “Black Lives Matter: We Stand Together.” Hundreds is families and students did too. Many of the shirts also included the message “#SayHerName,” a campaign to raise awareness about the often invisible state violence and assault of women in our country. The educator rally for justice for Charleena Lyles will start at 5pm in Magnuson park and then march to the 6pm press conference being held by Charleena’s family. entire world, after establishing it broadly in the U.S. and U.K.
video yet, those need a connect-in set up).